Come on FCA, just Hellcat all of the things! FCA is at a really interesting point with its car lineup at the moment. There are a few interesting small models like the Jeep Renegade and Cherokee, but enthusiasts mostly talk about the Hellcat-powered models like the Charger, Challenger and Grand Cherokee Trackhawk. The Trackhawk is the first non-Dodge and the first SUV to get the Hellcat motor. Who knows what models could get this engine in the future? Dodge recently announced an SRT version of the Durango, but some people are still holding out for a 707-hp Durango Hellcat. Dodge has not announced any plans to put the Hellcat engine in the Durango, but this hasn't stopped a Mopar shop near Phoenix called Plum Floored Creations from doing it themselves. Motor Authority reports that the owner of a 2011 Dodge Durango R/T wanted to get her husband a present, so she had PFC create the ultimate Durango with a Hellcat engine. The donor car had a 5.7-liter HEMI V8 mated to an older five-speed automatic transmission. This made the conversion a bit more difficult, despite the platform not changing much since 2011. 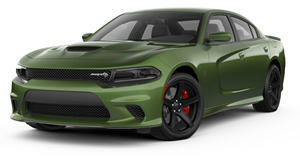 PFC dropped in the Hellcat engine, but swapped the 2.3-liter supercharger with a larger Whipple 2.9-liter unit. With all of these conversions, the Durango now puts down 698 hp at the crank and 570 to the horsepower on the dyno. This is a fair bit more than the 360 hp that the stock Durango had. The new supercharger pushes 11 pounds of boost to the 6.2-liter V8. The ECU on the old Durango couldn't run the blow-off valve of the stock Hellcat engine, but it is able to run the new Whipple blower. In order to install the supercharger, the 356-T6 alloy 6.2-liter heads were CNC machined. The Durango was also given a custom exhaust with three-inch pipers and five-inch tips. To handle the power going to all four wheels, the transmission was swapped with a six-speed ATS Stage 3 unit. The Durango won't launch as hard as a Trackhawk because there is no launch control. 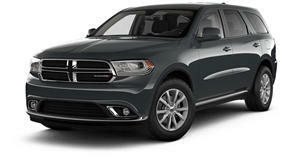 The gearing in the Durango makes its one-two shift just before 60 mph at 6,000 rpm. No 0-60 mph time is mentioned, but we bet that it will be pretty quick. To stop the SUV, PFC added six-piston calipers with slotted 15.0-inch rotors up front, and four-piston calipers with 13.8-inch drilled and slotted rotors in back. The stock wheels didn't fit over the brakes, so new 22-inch wheels were installed. To match the performance upgrades, this Durango has been given Hellcat decals and a new black and red interior with Hellcat logos stitched into the seats. This is really the closest thing that we'll see to a Durango Hellcat until Dodge actually builds one.